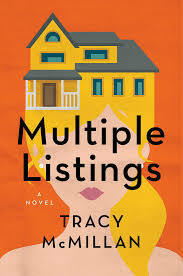 Multiple Listings review – a book by Tracy McMillan. Post may contain affiliate links. Multiple Listings is a light, enjoyable read. The main character, Niki, owns a home appraisal business. She is busy raising her son, Cody, and making things work with her boyfriend, Jake. Things seem to be going well, when Nicki’s father, Ronnie, shows up on her doorstep. he problem is that Ronnie has been in prison for the past 17 years and he and Nicki are definitely estranged. Ronnie has grown a lot in prison and wants to reconnect with his daughter and be a pard of his grandson’s life. Nicki doesn’t like this idea, but she does see how well Ronnie and Cody get along. The book is predictable and sweet. It’s about family and relationships, forgiving and growing. The chapters alternate between Nicki’s point of view and Ronnie’s, which allows us to see the story from both sides. I received a copy of this book, all opinions are my own. Springtime, and light reading on the porch is the way to go! This looks like a good read.